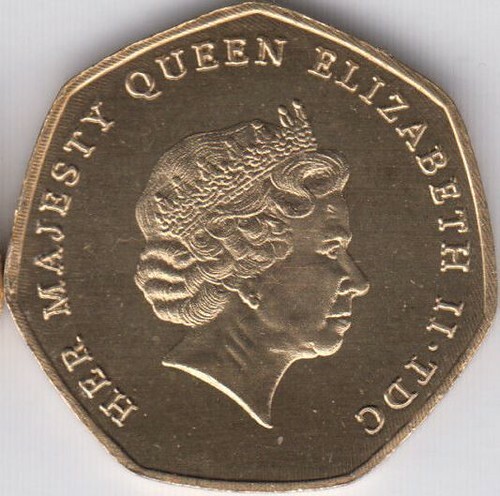 In 2017 a series of fantasy pieces with a fake denomination of 50 pence was issued for Tristan da Cunha. 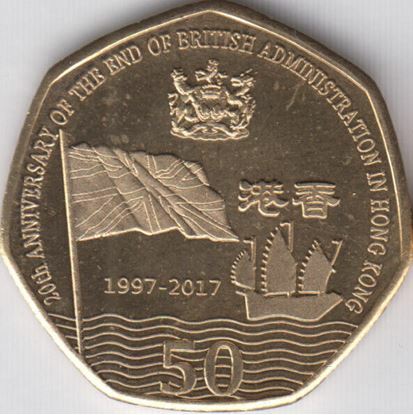 The pieces are dated 2017 and commemorate the Platinum Wedding Anniversary, 20th anniversary of the end of British Administration of Hong Kong and 20th anniversary of the death of Princess Diana. 20th anniversary of the end of British administration in Hong Kong. 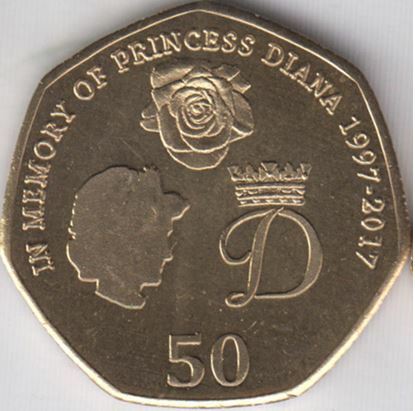 20th anniversary of the death of Princess Diana. 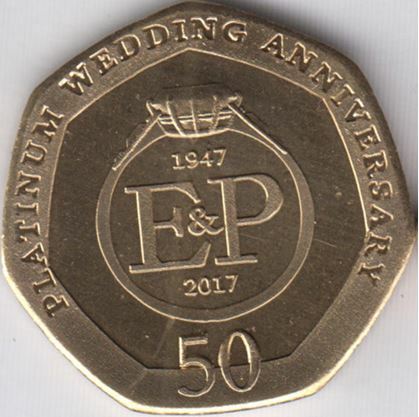 Platinum wedding anniversary of Queen Elizabeth II and the Duke of Edinburgh. Why do you think that these pieces are fantasy pieces with a fake denomination? Have you asked Commonwealth Mint? They should be able to ascertain…? 1. Commonwealth Mint does never use the coinage portraits of Queen Elizabeth II made by The Royal Mint. These 3 pieces depict the coinage portrait made by Royal Mint artist Ian Rank-Broadley. Commonwealth Mint uses the portrait that American artist Joel Iskowitz made for them. 2. The Ian Rank-Broadley portrait can not be used without the inclusion of the designers initials IRB. These pieces do not include these initials. 3. The Government of Tristan Da Cunha has never officially announced the issuance of these 3 pieces. 4. The pieces are only being sold by 1 dealer on eBay who sells a large number of fantasy pieces of other islands/countries etc. 5. Since 2017 Tristan da Cunha is no longer allowed to abbreviate its name to TDC on its coins, these pieces are dated 2017 yet depict the abbreviated name. Next to the exclusive use on the collectors coins of Tristan da Cunha (since 2015) and Alderney (since 2017), the Joel Iskowitz effigy is indeed in limited use on the collectors coins of Gibraltar for a few years now. A good summary although I do not think that the 2017 and 2018-dated circulation coins of Gibraltar will depict the 1985 Maklouf Effigy. I am sure they will introduce the special version of the Jody Clark portrait for use on the coins of the dependencies and territories. I don't believe that the special version of the Jody Clark portrait for use on the coins of the dependencies and territories will be introduced on Gibraltar currency. The license fee for the use of the effigy, allegedly, is high and one would assume that Tower Mint would prefer to use the newer effigy created by their own chairman rather than pay for the use of the Jody Clark effigy. The PR-effect of this combination should not be underestimated. The Niue Philatelic and Numismatic Corporation have stated that they have no intention to permit the use the Jody Clark effigy for Niue coinage and will continue with the 1985 Maklouf effigy and/or the Ian Rank-Broadley effigy depending on the preference of their customers. Interesting what you write regarding the use of the Joel Iskowitz effigy on Alderney coinage. I was unaware of this. The description "Joel Iskowitz effigy" is too honourable, in my opinion. Since Mr Iskowitz is not a sculptor but an illustrator, the three-dimensional version of the effigy must have been created by someone else. It was likely rendered via CAD-software like Type3 or Artcam; it was definitely not manually sculpted by a craftsman. I conclude that, increasingly, the choice of QEII effigy resides with the licensee/mint, not with the licensor/issuing authority. Commonwealth Mint last year obtained the exclusive minting rights for Alderney. I did not know that Mr Iskowitz is not a sculptor, although he is a talented craftsman I am a bit disappointed to hear this. Interesting to know what the Niue Philatelic and Numismatic Corporation said about the Jody Clark portrait. I only just noticed you are new here. I am fairly sure I know who you are, and if my thoughts are correct I am very pleased you are now a member of World of Coins Forum.